How to Save "Stressed Business"
*[Owner]* An industrial laundry system service company needed repairs and redesign done to their tooling. C-Mac made changes to the tooling to make access and ease of use to decrease service down times. *[Service Manager]* An industrial fan service company had a failure of a major shopping centre air conditioning fan/ blower. C-Mac repaired the unit within a 24hr turn around for minimum downtime. *[Owner/Manager]* A major food manufacturer specializing in tomato sauce had a filling machine breakdown. The machine was brought to C-Mac and repaired in 24hrs for minimum downtime of the production line costing $5,000 per hour. *[RAAF - Warrant Officer]* Airfield support staff required a portable sandbagging frame and requested a design, prototype and trials at no cost. There was nothing suitable on the market i.e. made in Australia. "Sandbagging Frames":materials-handling/1-bagging-equipment#silt-bagging-frame are now on the national procurement data base and some probably overseas at different war zones. *[Mechanical Design Engineer]* An automotive transmission design customer needed help with designing an automatic transmission gear prototype. We suggested and engineered a more cost effective and practical way for the mass production stage. *[Nursery Manager]* At an exhibition saw our self tracking nursery trailers and indicated he had a costly issue transporting large (heavy) pots containing advanced trees. Existing method was a bobcat. 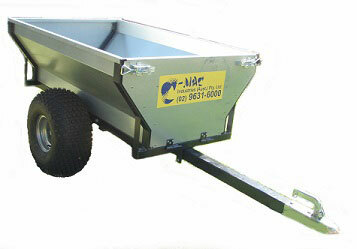 C-Mac designed and quoted for the manufacture of a Self Tracking “Low Loader”. His comment on the first day of using "Low Loader trailer":nursery-equipment/7-trailers/#low-loader-self-tracking-trailer “Can now move 100 litre pots with trees, 150 metres in 1 hr and not get a sore back”. *[Purchasing Officer]* A mining design and machining company needed help with machining components urgently as they were too busy to keep up with the demand. C-Mac machined the components so the deadline could be met. *[General Manager]* Customer had to submit a proposal and compete against other countries for the manufacturing facility. C-Mac submitted drawings to show there was space in existing plant to install the new process and to comply with all Australian OH&S Standards. Working together with customer to submit proposal to the Head Office overseas WON the contract. Project was a success meeting 6month lead time and budget. *[Nursery Owner]* Needed a specific Potting & Mixing machine. for his yuccas nursery, but the problem was it was no longer manufactured. From his description and specifications our engineers designed and modelled in 3D software his requirements. "Potting Machine":nursery-equipment/3-potting-machines/ was manufactured and fully tested with potting media in our workshop, video was then sent to customer who was very pleased with the results. Machine disassembled and freighted interstate and installed. *[Maintenance Engineer]* An industrial hydraulic fitting manufacturer had problems with gear and shaft breakages with their machinery. They also had problems repairing and maintaining. C-Mac offered to repair and maintain their machinery on-site instead of having to permanently employ fitters.